Two months ago a Baltimore County jury found a city police officer guilty of reckless endangerment in a bizarre and tragic training accident. Yesterday that police officer was sentenced to 60 days in jail and 2 years of reporting probation by a circuit court judge. The incident occurred just under one year ago at an abandoned state mental health facility. Several city police officers and trainees traveled to the county in order to use the facility as a tactical operations training ground. 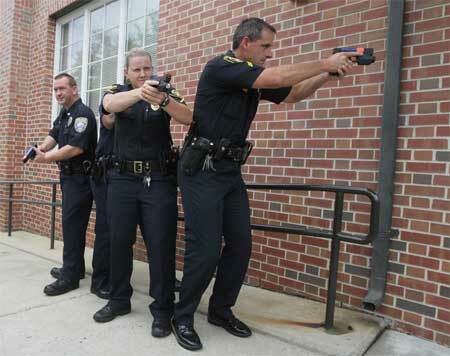 The cops were told to use training guns loaded with paintballs rather than bullets. And according to the incident reports all were using these simulated ammunition or simunition type weapons. All but a 19-year veteran of the force who fired his loaded firearm into a gathering of trainees huddled by a window. The bullet struck a young trainee in the head, resulting in severe brain damage and the loss of sight in one eye. County police and the state’s attorney conducted a thorough investigation of the incident and charged the officer with second-degree assault and reckless endangerment. The defendant and his attorney elected to go to jury trial, undoubtedly after attempts to have the case dropped prior to trial failed. At the close of the four day trial, the jury game back with a guilty verdict on the reckless endangerment charge. The defendant was found not guilty on the second-degree assault count, which actually carries a greater maximum sentence of 10 years in jail compared to the 5-year max for reckless endangerment. Both charges are misdemeanors in Maryland. Almost every crime on the books requires that the defendant have some sort of criminal intent in order to be found guilty. Reckless endangerment though is one of a few crimes that fall into a sort of gray area when it comes to the element of intent. A defendant clearly does not have to intend the actual outcome of his conduct to be guilty, but the conduct or act at issue cannot merely be an accident. There has to be something more, such as recklessness, to make it a crime. The jury agreed with the defense that the officer did not intend to injure or place the trainee in fear. But they believed that the conduct was more than just an accident. Legally speaking, the jury was convinced beyond a reasonable doubt that by discharging a live firearm onto the training grounds, the city cop engaged in a course of conduct that created a substantial risk of death or serious injury to another. The judge apparently agreed that the conduct was criminal in nature, and despite the officer’s 19 years of service denied the defense’s request for a suspended sentence. The criminal case may be over for now, but a pending federal civil suit for damages is likely to linger on for some time. The victim’s civil attorney is asking for $470 million in damages from various parties including the Baltimore City Police. In another bizarre twist to this tragic incident, the police apparently were using the property without permission. Six police academy officials were suspended, and the police commissioner actually halted training for some time. The Blog will follow the course of the civil suit, but there will likely be a settlement before the case goes to trial. Benjamin Herbst is a reckless endangerment lawyer who handles all types of criminal cases in Maryland including assault and firearm charges. Contact Benjamin for a free consultation about your case at 410-207-2598.